Home / News and events / News / The Fifth Progress Report of the London Declaration is out! The Fifth Progress Report of the London Declaration is out! Uniting to Combat NTDs have released the fifth annual progress report of the London Declaration on NTDs: Reaching a Billion: Ending Neglected Tropical Diseases: A gateway to Universal Health Coverage! This year's report has a special focus on universal health coverage, showcasing the opportunity for NTD programmes to be a gateway to UHC. NNN Chair Tanya Wood, and Chief Executive of ILEP, welcomed the report, saying: "More and more countries have eliminated NTDs like lymphatic filariasis, trachoma and onchocerciasis for good – meaning fewer people will have to suffer from their debilitating effects. This year, we’re proud of the achievements countries have made to beat NTDs. 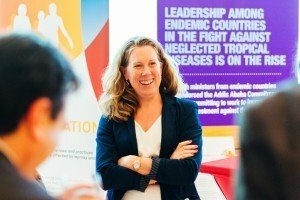 NGOs are uniquely placed to reach the world's least-served populations and therefore play a critical role in working with governments towards achieving universal health coverage."